Microplane recently released the SwiftStrip, a knife-like tool designed to remove leaves and trims the stems of herbs and leafy vegetables, like kale or even thyme. While there are many tools on the market, they often tend towards themed designs, like leaf shapes, or serve just one role, like trimming. The familiar knife shape design of the SwiftStrip makes it easier to use, or at least makes it easier to get used to. 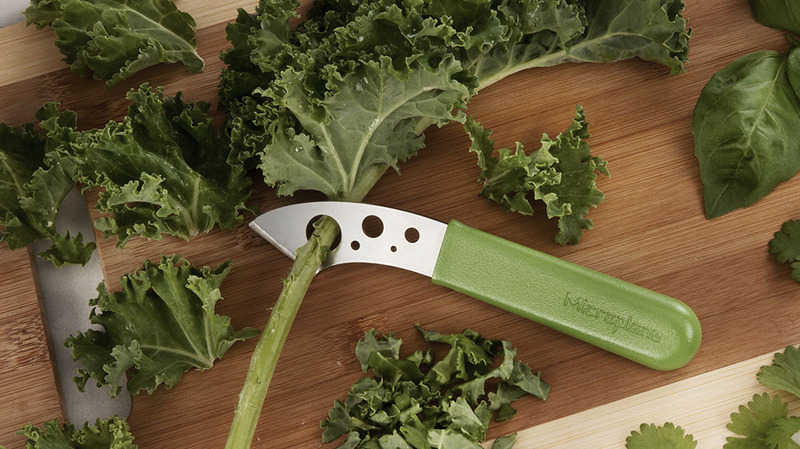 The tool features a stainless steel blade with five holes, each of varying sizes, so you can strip everything from extra large Tuscan kale to small thyme springs. At first, I wasn’t quite sure how to use it (the stems need to go through the tool in the right direction) but once I got the hang of it, stripping the leaves was quick and easy. I love the trimming function – a razor sharp, beveled edge on the blade that is the perfect sharpness and design to trim stems and herbs without crushing them. The edge doesn’t run all the way down the knife, so you can put pressure in the right places. The blade is very sturdy – when I used it, I could tell that, no matter how tough the leaves or the stem, it would work without snapping in half or bending out of shape. The SwiftStripper comes with a reusable protective cover. This clear cover does slide on pretty easily, but it can be a bit finicky, so be careful with it until you’re familiar with it. The downside is that it’s quite transparent – I anticipate losing it very soon. The bright green handle is soft and just squishy enough to be comfortable to hold without too much give. It was easy to manipulate the tool to ensure the most herbs came off the stems. The handle is well made; it won’t slide or snap off the blade (at least, not for a very very long time).